Lee Bul. 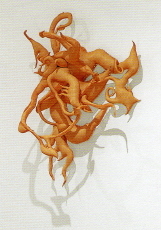 Sargasso III, 1998. Fabric, cotton filling, beads, pins, twelve elements, 45 x 70 x 20 cm.